I have a lot of fabric coming in every week. Give me a call to see if I have something you have to have. 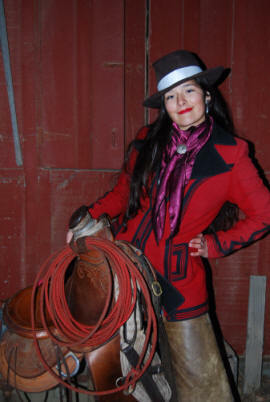 Buckaroo Brand wild rags are made by Amy Mundell from Crane, Oregon. Amy lives where cattle ranches are big and plenty. Amy started making wild rags for her family, and soon buckaroos were asking where they could get these unique wild rags. These wild rags are made from many kinds of fabrics, (silk, polyester, cotton, rayon) with wild and crazy prints. The fabrics are sometimes vintage, and only a limited amount is made of anyone kind. Buckaroo is our livestock brand, so it is only fitting to call these wild rags Buckaroo Brand. If you are after that perfect addition to your look, you can find it here. To order call Amy at 831-623-4542 or 916-204-7556 or use our shopping cart option for online payment. Scroll down to see the selection of Large wild rags.